After the Marineta Cassiana inlet, the coast changes, it turns rougher, more exuberant and attractive. It is the area known as Les Rotes, where creeks with turquoise waters follow one another having the Parque Natural del Montgó as background shaping its environment. Its waters are suitable for diving and discovering them by sailing becomes an unforgettable experience. El Trampolí, Punta Negra and Arenetes creeks are in this area. 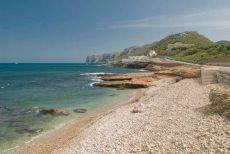 This is a cove of soft and fine sand, excellent for diving, due to the clear waters that make fish stocks visible. It has an island in the central zone (the Isla del Carmen) that divides the beach into two swimming areas, one of which is shallow and with calm waters, turning it into a natural pool ideal for the bathing of children. A perfectly equipped beach cove composed of soft, fine sand, located to the north of Cabo Roig. 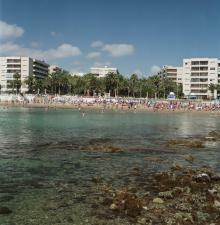 It is the longest beach of the Orihuela coast, situated in the area of ​​Campoamor. Its main attraction is played by the interaction of the reddish colour of the cliff, the golden colour of the sand and the deep blue sea which in this sector takes on a singular tone. 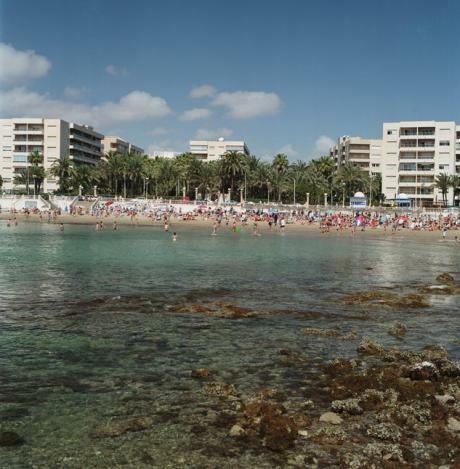 A beach of fine sand equipped with all the important services: hotel, restaurant, lifeguard station, parking, commercial centre, cinema, park, discotheque, sports zones, cafeterias and pubs. Beach located between Punta Margallo and the northern dike of an important port, of fine and golden sand and with a beautiful palm environment. Behind it restaurants and other catering services follow one another showing one of the most bustling images in this tourist area. Sheltered by the southern dike of the port, it is one of the beaches in Torrevieja with more ludic and sport animation and wide range of activities. Of semi-urban aspect, it shows clean waters and fine almost white sand. 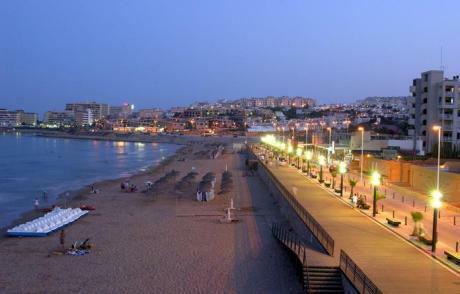 Its environment is marked by Las Salinas and La Laguna in Torrevieja. Fine golden sand, slight swell, flat sea bottom under clean deep blue waters are the characteristics of this beach. To the north, its environment is marked by small creeks following one another extending until Cabo Cervera. Beach adapted to people with reduced mobility. 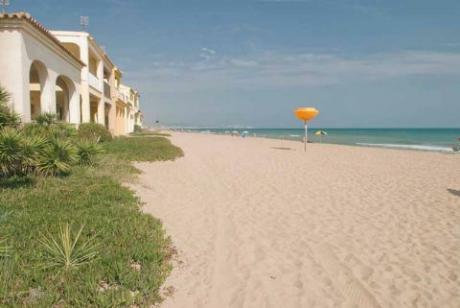 With an environment marked by rich orange tree fields, the beach is of fine golden sand and offers all kind of services. 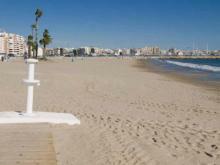 Accessible beach with all necessary services for people with reduced mobility. 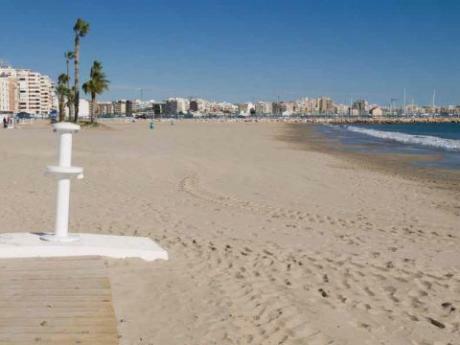 It is the longest beach in Torrevieja, and for this reason, almost twenty accesses from a well cared waterfront sowed with palms have been set up. In addition to its fine and golden sand, an attractive environment, within which Laguna de La Mata Nature Reserve stands out, can also be found. The Reserve has an information centre offering interesting routes to get to know the saltmarshes. What previously was a seaside quarter has turned into a bustling summer holiday camp with a beach of more than two kilometres, of urban ambience located in the middle of an environment dominated by an orange tree landscape. 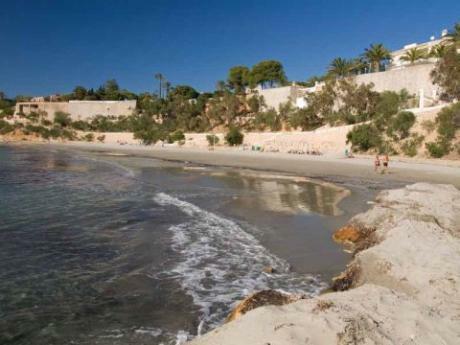 Beach of fine golden sand including seasonal facilities where hiring windsurfing boards. Accessible beach adapted to people with reduced mobility.